Do celebrity pets have more fun? Celebs are just like us — they love their pets! These posh pooches may be pampered by their famous owners, but they’re still like every other canine on the block. They love cuddling, snuggling, running in the dog park and chasing after mailmen. Check out 10 of our favorite celebrity pets. 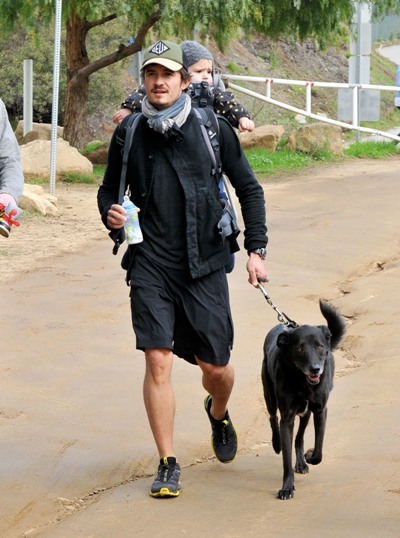 Orlando Bloom goes walking with dog, Sidi, and baby boy Flynn strapped to daddy’s back. Cyrus holds onto her puppy, Happy, a Rottweiler-beagle mix she found abandoned outside Walmart with former fiancé Liam Hemsworth. Ziggy, Liam Hemsworth’s Boxer pup, is just one of five dogs that the pair owed together. Cyrus bought Hemsworth his adorable furry friend as a 22nd birthday present. 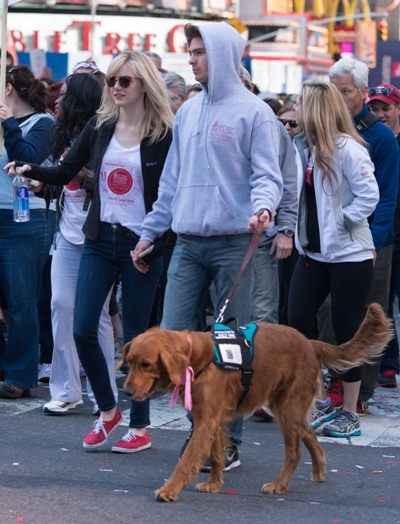 The Glee star hits the red carpet with her precious pooch, Olivia. The small dog was named after four-time Grammy award winner Olivia Newton John. Jen and Ben (or “Bennifer,” as some people call them) are spotted taking their German Shepherd for a casual stroll. The couple bought this pup after the death of their beloved dog Hutch. After Joss Stone’s scary kidnap attempt, she got two dogs for protection. She’s pictured walking Igor, a rescued Collie-German Shepherd. Former Pussycat Doll Kaya Jones knows that her red carpet look isn’t complete without pooch Kimba dressed in a matching outfit. Jones began her summer tour, Confessions of a Hollywood Doll, in late May. Even Real Housewives have to walk their dogs sometimes. Shocker! Roxie, Kyle Richards’ Wheaten, is the oldest and most beloved of all the Richards doggies. Fall Out Boy’s guitarist, Pete Wentz, has a bulldog best friend. Hemingway, obviously named after the American author, loves being his owner’s go-to sidekick. The pup was even photographed in Wentz’s wedding photos with now ex-wife Ashlee Simpson. Just when we were beginning to ask ourselves if Emma Stone and boyfriend Andrew Garfield could be any more perfect, they answered us yes — by adopting an adorable doggie on Christmas Eve! The trio is inseparable.